Running concurrent with the Vikign Energy main planning application, Shetladn Islands Council is also conducting "consultation" on finalising their own planning policy for windfarms over 20mW. The closing date for this consultation is the same as Viking Energy, 19 November 2010. Clearly the policy has been written to suit Viking Energy, and the timing is more than a coincidence. At the Planning Board meeting which considered the draft policy, the item was completed in less than 3 minutes. Two questions were asked by councillors as to whether 6 weeks was sufficient consultation. No answer was received. The meeting was cut short when Cllr. Garry Robinson noticed Cllr. Laura Baisley was getting ready to leave (and would have left the meeting inquorate), so he hasitly moved to accept the draft policy to be put out for "community consultation". See SIC current planning consultations. After many requests, the SIC has made the full transcripts of the planning consultation meetings held in September and October 2009. The original purpose of these transcripts was to accompany the SIC's submission to the Energy Consents Unit. The documents were only sent on 10/4/2010, more than 6 months after the meetings took place! Brae SIC planning consultation meeting- 28/9/2010. Aith SIC planning consultation - 29/9/2010. Dunrossness SIC planning consultation - 30/9/2010. Lerwick SIC planning consultation - 1/10/2010. These four meetings were supposed to reflect the views of all of Shetland. The views expressed were overwhelmingly opposed to the Viking Energy planning application (about 75%). Prior to these events, Sustainable Shetland attended a meeting with SIC officials and councillors planning the meetings. We appreciated being invited, but were unsuccessful in arguing that more locations should be included in the consultation. We said that four events did not give enough people in Shetland the chance to contribute to the debate. Instead, the SIC claimed these four meetings would be sufficient. We argued then, and say so again; this windfarm is an issue for all people, in all parts of Shetland. The official closing date for responses was 28 July 2009. After this deadline, Viking Energy announced that they may be bringing out additional information. If this additional information appears, an additional 28 days consultation will begin. This application is currently in limbo, the official deadline passed in July 2009 for the public, and October 2009 for statutory consultees. If Viking Energy issue additional information, and the Energy Consents Unit considers is significant enough to class as an amendment to the application, then another 28 days consultation will begin. At the current time no addendum, and no additional information has been published. This means the current application is the only offer on the table. The application has not been withdrawn. Royal Society for the Protection of Birds. Read RSPB wind farm objection. Or visit RSPB web site. Scottish Environmental Protection Agency (SEPA). Read SEPA Viking Energy objection. Or visit SEPA web site. Scottish Natural Heritage (SNH). Read SNH Viking Windfarm objection. Or visit SNH web site. Sustainable Shetland. See our main objection and landscape objection. Shetland Amenity Trust, full objection here. John Muir Trust, objection here. Or visit John Muir Trust web site. To date, 3/2/10, there have been 2544 responses to the Energy Consents Unit. 2026 opposing the wind farm, and just 518 in support. There are also other planning applications in progress connected with the wind farm. This is an outline planning permission to build a converter station in Upper Kergord in the Weisdale valley. The SIC is planning authority, but they have yet to consider the application even although it was made on 31/7/09. We have objected to this application because it is part of the Viking Energy Wind farm. Sustainable Shetland converter station objection is here. Planning permission for test weather masts expired in March 2008. However some masts (those which hadn't blown down) were still standing in October 2009. Viking Energy had also breached a number of planning conditions relating to this masts. A new planning application for 5 new masts was submitted in November 2009. As part of the infrastructure of the Viking Energy wind farm, Sustainable Shetland objected to this application, and asked that councillors themselves consider the planning application, rather than just delegate it to the officials who didn't enforce the planning application first time around. The deadline for comments for this planning application was 25/12/09. Our masts objection is here. The area of the proposed development consists of heather clad hills with a significant area of active blanket bog, i.e. peat forming. This habitat is an important carbon sink and is protected under European legislation. The size and scale of the proposed wind farm and its associated infrastructure will irrevocably change the character of this fragile landscape. Vast quantities of peat will be moved in order to construct 150 turbine bases, 14 quarries, 8 construction compounds, 3 substations and 73 miles of new roads. Blanket bog also serves to regulate water flow and this is very important during periods of high rainfall. If the bog surface is damaged then this capacity to regulate water flow is lost. There is a risk of serious landslips and severe erosion, changes in run-off are likely to damage burns and lochs where native brown trout are found. Possible changes in down-slope hydrology are highly likely to impact on important blanket bog habitat. Sediment run-off could also effect the substantial aquaculture industry in the surrounding voes (sea-lochs). Blanket bog is a carbon sink and takes thousands of years to form, it actively absorbs and stores CO2. The release of this CO2 into the atmosphere will negate much or all of the perceived environmental benefits of the wind farm. Viking Energy’s own submission says that the CO2 payback period could be as long as 48½ years. This project could irreparably damage globally important peat habitat that is scientifically recognised as vital in mitigating climate change. This development is contrary to SPP6 regulation, which states that villages must be more than 2km away from large turbines. Wind turbines generate noise, and settlements close to the site will experience noise pollution particularly in certain weather conditions. Some houses are only 0.9km from turbines. The phenomenon of infrasound vibration is also becoming noted in many instances relating to existing wind farms. The wind farm will impact on breeding birds directly through death from collision and indirectly through displacement of breeding birds through disturbance or habitat change. Viking Energy studies show that 3.8 % of the UK breeding population of Red-Throated Divers and up to 15.7 % of the UK breeding population of Whimbrel breed within the site. Viking Energy’s own estimates suggest that in total a minimum of 5,700 birds will be killed through collision during the 25-year life cycle of the wind farm. This includes e.g. 152 Red-throated Divers, 1,562 Golden Plovers, 1,460 Curlew, 262 Whimbrel and 252 Arctic Skuas. Losses in breeding numbers due to indirect impacts are much more difficult to predict. Construction of this wind farm will require vast loads of industrial plant and materials moved over local roads for many years. Many roads are single track. Construction traffic could be damaging and dangerous. The Shetland Visitor Survey 2006 states that tourists’ “main inspiration to visit were birds, wildlife, nature and flora, followed by peace and quiet, remoteness and the scenery”. This project will seriously harm this. It is also contrary to the Shetland Cultural Strategy plan that states we must “Safeguard the wildlife, sea life and high quality natural environment (including landscapes) of Shetland” and “Promote the sustainable wildlife, sea life and high quality natural environment of Shetland”. Within the Shetland Structure Plan the Shetland Islands Council also states “The preservation of Shetland's built heritage and the maintenance of a clean, productive natural environment, with its associated landscapes and wildlife, is critical to the future development of the tourism industry”. The turbines will be clearly visible in the panoramic views across Shetland. 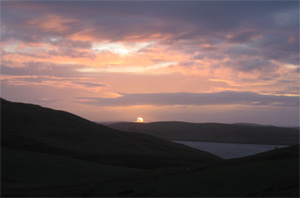 Views in Shetland are characterised by unspoilt openness across the isles and the dominance of the sky in the landscape, creating a sense of wilderness, remoteness, space and tranquility. This development presents a loss of visual amenity for large areas of Shetland. We are working on updating this web site to reflect new information in Viking Energy's planning "addendum", so at the moment some information may refer to the initial wind farm planning application and not the addendum. We appreciate your patience as we work on updates to this site.